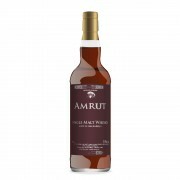 I haven’t tried all of the Amruts yet, but I should make it a life mission to do so. The Intermediate Sherry and the Two Continents are both on my dream team wishlist, but they’re both in the $150+ range. However the CS release isn’t and it doesn’t disappoint. This one is at 61.9% and was bottled in 2007. Nose: Lovely orange tang, like Orangina. Marmalade on toast. Drying, musty oak. Another reviewer said sawdust; very perceptive. Melons, pineapples, peaches, and big juicy dates drizzled in honey. A very refreshing fruity quality to this to counter the granular woody notes. After a couple of minutes in the glass, the rough edges from the high abv. disappear, and the nose becomes smooth and luscious. Palate: Salt, marmalade, gentle vanilla, cereal, roasted almonds, leather, nutmeg, light caramel and peaches; all of which cooperate beautifully with that familiar sawdust note. The arrival is gradual with a well-timed buildup, slowly moving us towards a crescendo of fruits and spices (more nutmeg and white pepper). Finish: Guess what? More sawdust. The faintest of wisp of smoke seems to be just out of reach. Leather. Some juicy peaches reappear. More gentle vanilla. Almonds. Nutmeg. Orange rind and Orangina. A touch of tea. Wow… Long and gorgeous. CS is almost always the way to go, and Amrut’s no exception. I’ve tried the standard fare and the Fusion. I liked them, but this one outshines both. What I like is that it isn’t just the standard single malt on steroids; there’s more to it than that. 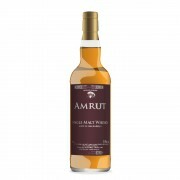 The sawdust note is unique and lovely, and it counterbalances the rich, fruity sweetness. 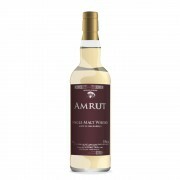 I’ve yet to meet an Amrut I didn’t like. It’s a shame that the more premium offerings are so expensive in Taiwan. However, this stuff is both affordable shockingly good. Highly recommended. Can I put in a plug for the Portonova and intermediate Sherry? Both hard to find, both pricy, both worth trying. I mentioned the Intermediate Sherry, but the Portonova is another I'd love to try. Tried this from a miniature in December during my Calgary malt adventure. It was excellent. And surprisingly, we found some bottles of the original 2007 bottling later in our journey so I have a couple salted away. I currently have a bottle of a subsequent batch open, and though the ABV is shockingly lower at 61.8%, it is also an excellent expression. 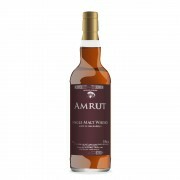 I've heard of batch variation with Fusion, but I've never tasted an Amrut I haven't liked a lot. @hunggar great review as usual. I tried the 61.8% CS (and yes, @Nozinan, I was also disappointed at the massive drop in ABV) and found it to be quite intense. They both seem to have the same core elements, lots of nuts and sweet citrus. I missed the sawdust in the 61.8% version. Might have to go back and double check. I also second the Intermediate Sherry and Portonova - insanely gorgeous the both of them. I like their new single cask offering as well. If you were to pick one I recommend the Bourbon cask. I've done a review of all three.